Cymbal (kymbala) - Alajos Stróbl. The sculptures were manufactured during 1882-1883, and were erected at the spring of 1884. All of these artists came from different places with different backgrounds, so it seems to be an enormous achievement to have this series referring to traditional Hungarian instruments in such a unified and complex way. 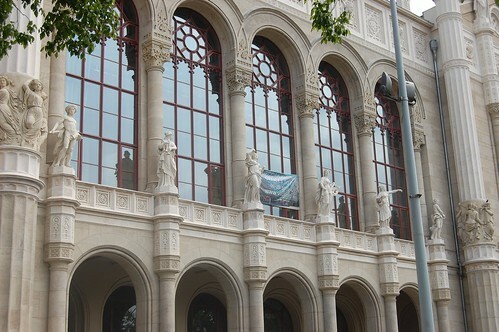 - The story of the indoor sculptures is even more complicated (they were finished for 1901), and since a radical refurbishment of the building going back to the roots is still in progress, I have no photos on them. However, I never saw them in real life: they were not placed on their original spot after the first major refurbishment of the building has been done in the 1970s, when most of the inner ornaments have been replaced by plain artificial marble. Frankly, all of these sculptures were seriously injured or completely destroyed during the siege of Budapest in 1944-45, so all what you see today are heavily refurbished originals or resculpted replicas.